Plant remedies have been used throughout the world for millennia and are one of nature’s tools for living a healthy and vibrant life. Aromatherapy comes from the fact that essential oils are, by nature, aromatic. Their aromas elicit physical, emotional and mental responses. An easy way to aromatically use essential oils is to open a bottle and breathe in the aroma through the nose or place a drop of an oil in the hands, rub them together and then cup around the nose and mouth and breathe in. Another aromatic technique, the technique I use most often, is diffusion. Diffusion is the easiest and most rapid and comprehensive way to benefit from aromatherapy. This technique is beneficial for affecting mood, killing airborne pathogens and changing the aroma of a space. Diffusers are devices that can be used to evaporate essential oil into a surrounding environment. The bet diffusers are atomizing and employ cold air to force the essential oil through the atomizer; separating the oil into tiny particles that create a micro-fine vapor in the air. Another diffuser option is a vaporizing diffuser that uses ultrasonic waves to emit the oil and water particles into the air. My personal experience with essential oils has been 100% positive. I’ve educated myself by reading publications by reputable sources and attending workshops. As part of my self-care routine, I diffuse (or roll-on) an essential oil blend in the morning before work, during meditation, during my personal yoga practice and when I teach yoga classes. The energizing and uplifting blends are great for the afternoon slump. Select an essential oil or blend according to your needs. 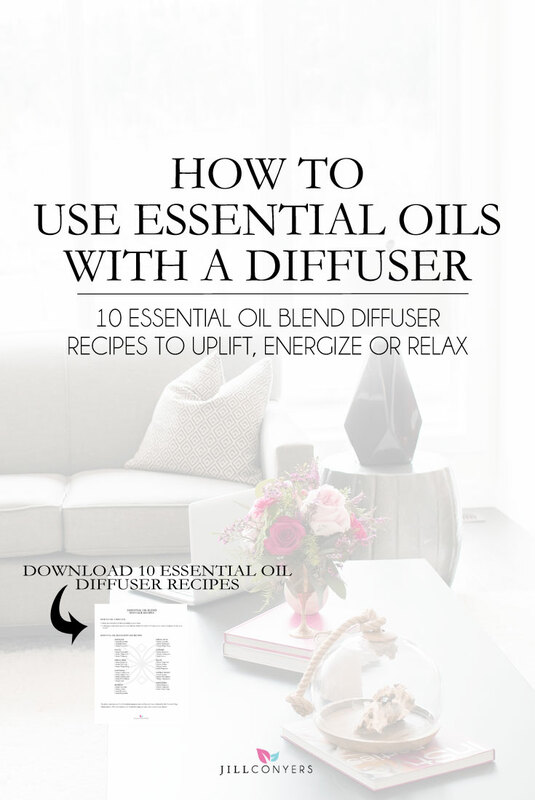 Following the directions specific to the diffuser, diffuse for about 10-15 minutes at a time throughout the day or as needed. Essential oils are made of simple and pure botanical ingredients to unlock nature’s ability to improve our well being. When used correctly, essential oils are therapeutic and effective. I encourage you to learn more about how to use aromatherapy safely and effectively by attending workshops and consulting reputable publications and qualified aromatherapists. The above statements are for informational purposes only and have not been evaluated by the Food and Drug Administration. This information is not intended to diagnose, treat, cure or prevent any disease. Do you use essential oils? What was your experience? Do you have a favorite blend you use often? I’ve been wanting to try essential oils and this guide is perfect! My only questions is about safety around babies. I have a 6 month old and I heard you have to be careful about exposing too early. Do you know more? I started using essential oils on my children a few years ago, oh my goodness I wish I’d discovered them sooner! Have just expanded my collection and intend to get a few more! I love mixing up my essential oil especially lavender and lemon. Thanks for sharing. This trend has grown so much in the last few months I feel. I had no idea that it was so popular. Love your oil combos, I’ve dabble just a bit in aromatherapy when I was in health care administration. But never in a personal level. Would love to try it out, looks like this is a great place to start! I’ve recently started using essential oils and want to do so more. I’d like to start using it for cleaning house purposes too. I want to get a diffuser but I always forget when I am out! I pinned this post for the different fragrances you mentioned. Oh it sounds so relaxing. I could feel the weight taken off my shoulders imagining what they smelled like. I have been hearing all the rave about essential oils lately. I think I am going to jump on the bandwagon and buy myself a diffuser and essential oils. I love diffusing essential oils! It always puts me in a better mood! I love my essential oils. Thanks for the recipes…I’m always looking for new blends. Wow! I am a scent lover and your post about mixing essential oils is so interesting. I personally love Ylang Ylang and Bergamot fragrances and I see both of them have similar properties. Thank you for sharing this. I love essential oils and I have a diffuser in my room and in the living room, I love mixing oils to create my own special scents. This needs to be a bigger part of my life! I downloaded the info- thank you for sharing! Do you have a favorite place to get your oils? This was very helpful! we bought a diffuser at christmas but haven’t figured out the right routine or blends for it. this will help! I am so glad to read your post and as I have never truly understood what the essential oil health benefit for. I love the smell..but I didn’t know there is so much health benefit with them. I am saving your list now and will definitely give it a try from now. I love the orange and lavender especially. You have some great recipes here! This is just a great resource and I am so happy I found it! I am so looking forward to trying many of the recipes you have shared here. Thank you very much.